This room can be booked for a single night and has a south-facing window. It is decorated with many different horse pictures. The queen-sized carved headboard, decorated with running horses, was purchased in Pennsylvania and returned to Arizona where it had originally been carved. The bathroom has been remodeled and is no longer a “water closet.” The room has a door that leads out onto the cool, calm verandah. The north-facing window in this bedroom overlooks the patio and the Spirit Tree. 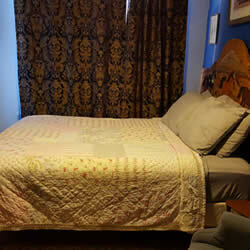 It has a king-sized bed and is furnished with some fine pieces of antique furniture. The bathroom has a shower. The second door leads out to the cool, calm Veranda filled with plants. This bedroom has a north-facing window overlooking the patio and the Spirit Tree. You can see any number of birds while sitting in this room and looking out on the feeders in the patio. 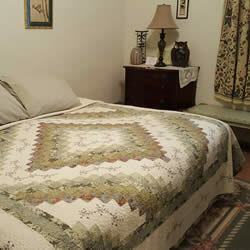 It can be arranged as a single king bed or two twin beds. The Oriental touches give it its name. A wonderful antique armoire found in Ohio serves as a closet. You step down 2 steps into a charming room with two bay widows, one with a window seat. A great family room that can sleep up to 4 people. 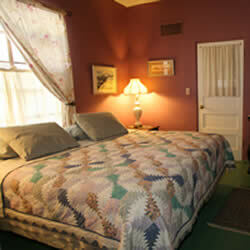 It has a loft containing a queen mattress for older children or younger adults and a queen bed for mom & dad. This room contains many types of books and is decorated with American Indian accent pieces. 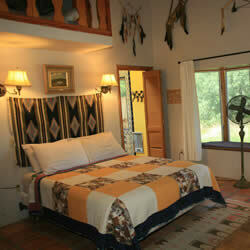 It has a little more privacy as it is located near the front door of the ranch house away from the other bedrooms.